This Northern Mockingbird was singing a merry tune atop his tree stump this morning. The northern mockingbird (Mimus polyglottos) is the only mockingbird commonly found in North America. This bird is mainly a permanent resident, but northern birds may move south during harsh weather. This species has rarely been observed in Europe. This species was first described by Linnaeus in his Systema Naturæ in 1758 as Turdus polyglottos. The northern mockingbird is known for its mimicking ability, as reflected by the meaning of its scientific name, 'many-tongued mimic.' The northern mockingbird has gray to brown upper feathers and a paler belly. Its tail and wings have white patches which are visible in flight. 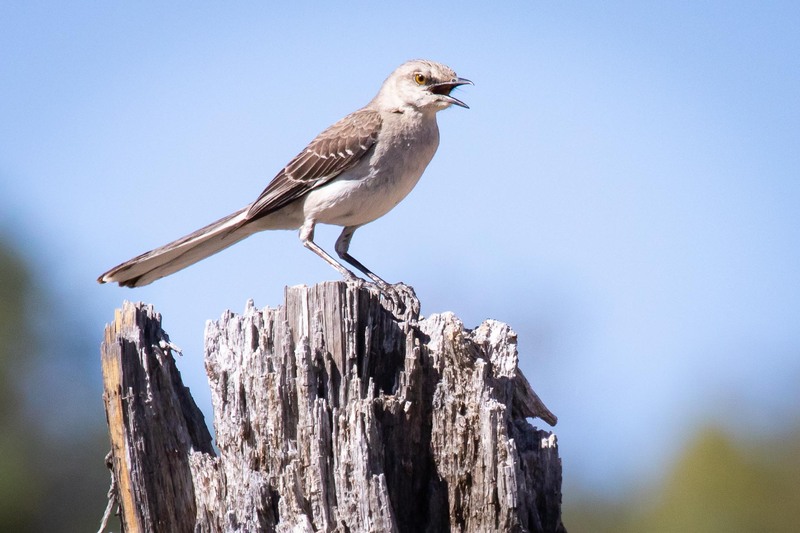 The northern mockingbird is an omnivore. It eats both insects and fruits. It is often found in open areas and forest edges but forages in grassy land. The northern mockingbird breeds in southeastern Canada, the United States, northern Mexico, the Bahamas, the Cayman Islands and the Greater Antilles. It is replaced further south by its closest living relative, the tropical mockingbird. The Socorro mockingbird, an endangered species, is also closely related, contrary to previous opinion. The northern mockingbird is listed as of Least Concern according to the International Union for Conservation of Nature (IUCN).